Refinishing a sink is a great option. 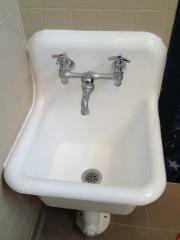 It should be considered for your cast iron sinks, laundry tubs, old mop sinks and even bathroom pedestal sinks. Like bathtubs, the shapes, sizes and materials used have changed over the years so often it is difficult to find a similar type sink that fits the area. If there is nothing inherently wrong with the sink, (for example, rust), and there are no plastic or metal lips around it, then refinish it. The colour can be changed, small blemishes or imperfections can be fixed and once it is refinished, it will brighten up your bathroom. It will be shiny and smooth and easy to care for. Dr. Tubs Reglazing doesn’t suggest refinishing kitchen sinks, as the glaze isn’t made to withstand the impact of cutlery and other kitchen utensils. While refinishing paints and chemicals are safe to be used on surfaces that we bathe or wash ourselves in, they should not be used in areas where food is prepared. That being said, Dr. Tubs Reglazing has refinished cast iron kitchen sinks that have been reglazed previously. The caveat is that the sinks were done before and the owners were familiar with caring for them in a kitchen environment. **Please note that there is no warranty offered for sinks. Sink refinishing, tubs, tile & sink repair in Toronto. Dr. Tubs Reglazing refinishes sinks, cast iron sinks, laundry tubs, old mop sinks, bathroom pedestal sinks.